PURPOSE: Insulin-like growth factor 1 (IGF-1) is a potent mitogen with well-described trophic and anti-apoptotic effects on neurons, myocytes, and Schwann cells (SCs). 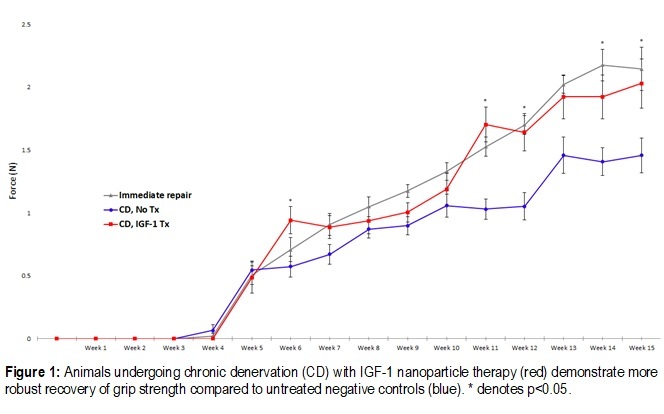 The aims of this study are to (1) encapsulate IGF-1 into biodegradable nanoparticles (NP) to enable sustained release at target tissue sites; and (2) assess the efficacy of locally delivered IGF-1 NPs to improve functional recovery following. METHODS: (1) NP Fabrication: Varying ratios of IGF-1:polymer were evaluated. Loading efficiency and in vitro NP release kinetics were evaluated and mitogenic activity of released IGF-1 was assessed. (2) The effects of locally-delivered IGF-1 NPs. The effects of IGF-1 NP treatment on axonal regeneration, muscle atrophy and reinnervation, and recovery of forepaw motor function were assessed in vivol. RESULTS: (1) An encapsulation efficiency of 83.2% was achieved. The 1:5 PEG5k-PCL40k formulation yielded optimal release of IGF-1 with near-zero-order release of IGF-1 for at least 70 days. Released IGF-1 exhibits comparable bioactivity to native IGF-1. (2) IGF-1 treated animals recovered significantly more forceful grip strength compared to negative controls (Fig. 1). IGF-1 treatment limits muscle atrophy during periods of denervation compared to negative controls (620 vs. 340um2; p <0.05) and enhances neuromuscular junction reinnervation (41 vs. 27%, p <0.05). CONCLUSION: Sustained release of bioactive IGF-1 was achieved. IGF-1 NP treatment in vivo limits muscle atrophy during denervation and improves functional recovery of forelimb grip strength.